Franklin, 63 vs. Brighton, 35 – Final – Click here for a photo gallery from this game – Franklin clamped down defensively, forcing Brighton into 32 turnovers on its way to a big win over the Bengals. The Panthers forced 12 turnovers in the first quarter alone and hit their first eight shots from the floor, taking a 25-6 lead after eight minutes of play. Junior Chris Edgehill had a team-high 15 points, senior Will Harvey added eight points, and Jack Rudolph finished with seven points and three assists. Franklin will play host Bridgewater-Raynham in the championship game of the Larry Fisher Holiday Tournament on Saturday at 4:45. King Philip, 64 vs. New Mission, 72 – Final – King Philip cut the deficit to just three points late in the fourth quarter but New Mission finished strong to close down the Warriors. Bruce Sanitilus scored 10 of his team-high 16 points in the final frame to help KP get back into the game. KP scored 38 points in the second half after being held to 26 in the opening 16 minutes. Alex Fritz added 14 points (11 in the second half) while both Andrew McKinney and Tim Nault finished with 11 points. King Philip will play host Auburn in the consolation game on Friday night at 5:00. Milford, 60 vs. New Bedford, 51 – Final – Milford built an eight-point lead (19-11) after one quarter, led by 11 at half and after three quarters, and held on for a win over New Bedford. Senior Brendan White had a team-high 17 points and hauled in 14 boards while sophomore Jordan Darling also had a big night, scoring 13 points and grabbing 10 rebounds. Oliver Ames, 66 vs. Dighton-Rehoboth, 29 – Final – Click here for a photo gallery from this game – Oliver Ames turned a dominant performance on the glass into a big win over Dighton-Rehoboth in an opening round game of the Muscato Tournament. The Tigers had an 11-0 advantage on the boards in the first quarter, grabbing six offensive boards to jump out to a 23-7 lead. OA continued to control the boards with a 23-3 advantage at halftime, resulting in a 34-16 lead at the break. Junior Jay Spillane had a career-high 14 points to pace the Tigers while senior Ethan Eckstrom added 11 points. OA will play Cardinal Spellman in the championship game on Saturday. Taunton, 77 vs. Charlestown, 53 – Final – Taunton outscored Charlestown 24-9 in the second quarter, and put up 48 points between the second and third to earn a double-digit win over Charlestown. Senior Wesner Charles scored a career-high 21 points while junior Dante Law also had a 21-point performance, including 13 in the first half. Senior Mike Quinn added 11 points and Naz Kenion chipped in with 10 points. Taunton will play host Durfee in the finals of the Skip Karam Holiday Classic on Friday at 6:30. 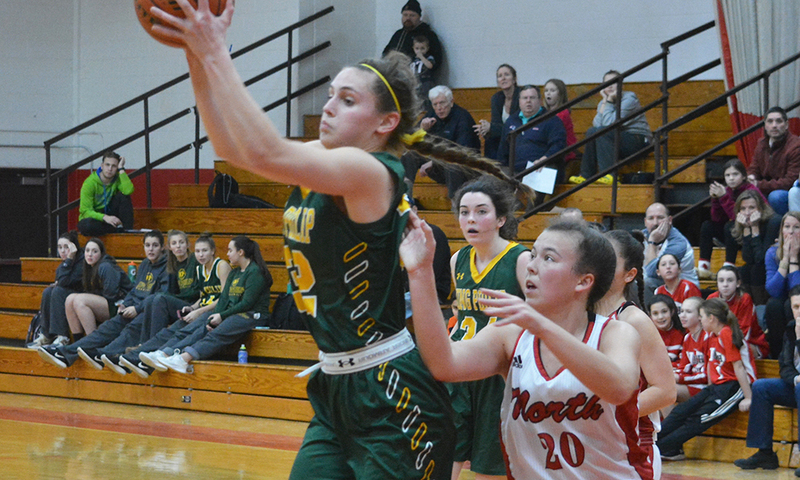 Attleboro, 42 @ North Attleboro, 34 – Final – Liv McCall scored 16 points to send Attleboro into Saturday’s final of the North Attleboro holiday tournament. Attleboro coach Marty Crowley credited the Bombardiers great team defense and added that Lillian Froio played really well off the bench. Oliver Ames, 47 vs. Needham, 64 – Final – Oliver Ames trailed by just a point after three quarters but the Rockets dominated the final quarter, outscoring the Tigers 23-7 to earn the win. Freshman Caroline Peper had a career-high 19 points for Oliver Ames, who will host Brockton in the consolation game of the Sue Rivard Holiday Tournament on Friday at 6:00. Sharon, 34 vs. Middleboro, 38 – Final – Emma Eberhardt led the way for the Eagles with 17 points. Stoughton, 39 vs. Belmont, 70 – Final – Stoughton junior Aliyah Wright had a team-high 11 points for the Black Knights, who will play Newton South on Friday at 5:00. Taunton, 65 vs. Durfee, 49 – Final – Taunton jumped out to a 13 point lead by halftime (31-18) and kept control in the second half. Sonya Fernandez had another strong all-around game for the Tigers with 20 points, eight rebounds, and nine blocks. Alexa White added 17 points and Lily Patneaude chipped in with 11 in the win. Franklin, 2 @ Mount St. Charles (R.I.), 3 – Final (OT) – Franklin senior Joe Lizotte and junior Shane McCaffrey each scored once but the Panthers fell in overtime to host Mount St. Charles. Ryan Cameron had an outstanding game in net for the Panthers. The game will go down as a tie for MIAA purposes. North Attleboro, 2 vs. Cumberland (R.I.), 0 – Final – Tyler Sarro and John Connolly scored for the Rocketeers, who earned their first win of the season. Oliver Ames, 7 vs. Matignon, 0 – Final – Brett Williams scored two goals and assisted on another and Cullen Gallagher had one goal and a pair of assists to power OA to Friday’s tournament championship game against Hanover. Colin Bourne, Max Ward, Ross Carroll, and Brad Powers also scored for the Tigers, while Owen Connor made nine saves to record the shutout. Stoughton, 5 vs. Tri-County, 3 – Final – Stoughton’s offense exploded for four goals in the second period, helping the Black Knights pick up the win. Senior Carter Gerome and freshman Colin Alessi each scored a pair of goals for the Knights while freshman Joe McNulty scored the other goal. Canton, 3 vs. Medfield/Norton, 2 – Final (2 OT) – After Medfield/Norton scored twice in the third period to grab the lead, Maggie Malloy scored with just 44 seconds remaining in regulation to tie the game at 2-2, forcing overtime and keeping Canton unbeaten this season (both teams get a point for MIAA standings). During the 3-on-3 second OT period, Lauren Fitzpatrick went the length of the ice for her second goal of the game to send the Bulldogs into the Ice House tournament final to face Westwood. Fitzpatrick also opened the scoring for Canton with a second period goal assisted by Lizzie Tassinari and Payton McDonough. Taunton, 76 vs. Coyle & Cassidy, 53 – Final – The Tigers raced out to a 23-9 lead after the first quarter, extended it to 35-20 by halftime, and never looked back to pick up their third win of the season. Junior Dante Law scored a career-high 28 points, including 15 points in the first half. Senior Michael Quinn scored a career-high 16 points and John Martins finished with 12 points for Taunton. Taunton, 49 vs. Coyle & Cassidy, 60 – Final – Taunton led 27-22 at the half but Coyle responded after the break to avoid the upset against its city rivals. Sonya Fernandez had a strong game for the Tigers with 20 points and 16 rebounds, while Alexa White had 12 points and Lily Patneaude had nine. North Attleboro, 69 @ Attleboro, 89 – Final – Attleboro 200 medley relay team of Colton Parkinson, Connor Dunn, Alex Harrop, and Matt Marcil took first, and each member won at least one individual event as the Bombardiers earned a win over North Attleboro. Parkinson also won the 200 IM and 100 breaststroke, Dunn touched first in the 50 free and 100 free, Harrop won the 100 fly, and Matt Marcil took first in the 100 backstroke. Parkinson, Dunn, and Marcil teamed with Brett Wortham to win the 200 free. North Attleboro, 66 @ Attleboro, 98 – Final – Liz Saltz, Tiffany Chan, Jackie Lynch-Bartek, and Ella Lynch-Bartek teamed up to win both the 200 medley relay and the 200 free relay on top of individual wins to pace the Bombardiers to a win. Saltz also won the 50 free and the 100 fly, Chin took first in the 500 free and 100 back, Jackie Lynch-Bartek touched first in the 200 free and 100 breaststroke, and Ella Lynch-Bartek was first in the 100 free. Oliver Ames, 132.9 @ Attleboro, 130.55 – Final – For the second straight meet, Oliver Ames junior Lauren Picanzi took first in the All Around, this time scoring a 34.3. Picanzi scored an 8.65 on the beam and an 8.7 floor. Sophomore Ashlyn Latham was second in the overall, highlighted by an 8.6 on the floor. OA senior Gianna Martucci added an 8.8 on the floor and an 8.6 on the beam for the Tigers. Brigham is the lone member of last season’s HockomockSports.com First Team to return this season, the two-time reigning HockomockSports.com Underclassman of the Year is one of the reasons that expectations are really high in Franklin this winter. Last year, while averaging 15 points per game, Brigham showed that her game is expanding, as she demonstrated the ability to step away from the basket to knock down shots and even take players off the dribble. At 6-foot-3, she will tower over most teams in the Hock this season and should be penciled in for a double-double just about every night with her ability to control the paint on both ends of the floor. Teams are going to throw double teams, zones, and different defensive looks at Brigham every night, so her movement to find pockets of space and her passing will be important to keep the Panthers humming on offense. Already one of the league’s best rebounders (14 rebounds per game last year) and shot blockers (twice recording more than 10 blocks in a game), Brigham, who is getting Div. I looks, should also be one of the league’s top scoring threats this season and a top contender for player of the year. With the graduation of Meg Hill, Danehy is going to have to play a much bigger role as Mansfield’s primary post scorer and with the Hornets adopting a more up-tempo offense this season Danehy is the type of forward who can benefit from easy baskets in transition. The senior forward has the size (5-foot-11) and the long reach to be effective in the post and she has become a much more physical player in the past two seasons on varsity, which Mansfield will need as the Hornets try to make up for some of Hill’s rebounding. Danehy has a solid short-range jumper and is quick off her feet to get on the boards ahead of most interior players. At the end of last season, there were games in which Danehy was Mansfield’s most effective player and this year she should get even more chances to fill the stat sheet as the Hornets find their new identity as a fast-breaking team. Eberhardt is coming off another strong season for the Eagles, in which she averaged a team-high 13.6 points per game along with nearly five rebounds, more than three assists, and more than three steals a night. A versatile scorer, Eberhardt has the size and handle to get to the basket and finish or to get out on the break and score in transition, but she can also step back and knock down jumpers from the outside to extend the defense. Sharon counts on Eberhardt to be the primary playmaker as well as looking for her own shot and she has the ability to step up and guard multiple positions. A strong rebounder throughout her career, Eberhardt has developed an all-around game that has the Eagles eyeing a run at a state tournament spot this winter. North Attleboro is coming off a rebuilding year that saw several young players emerge and give the Rocketeers hope for a much better winter this time around, but it is the veteran presence of Feid that brings everything together for North. The senior small forward, who averaged more than eight points a night last year, has the length and the handle to get into the paint and cause problems for opposing defenses, but also has the range to step outside and knock down jumpers. North doesn’t have a lot of size in the paint, so Feid will also be counted on as a rebounder and as someone that can help off her player and defend the rim. The most important thing that Feid will bring this year is the confidence that comes from experience, helping the Rocketeers avoid the scoring droughts that held them back last season and keeping things calm against the pressure defense common in the Hock. 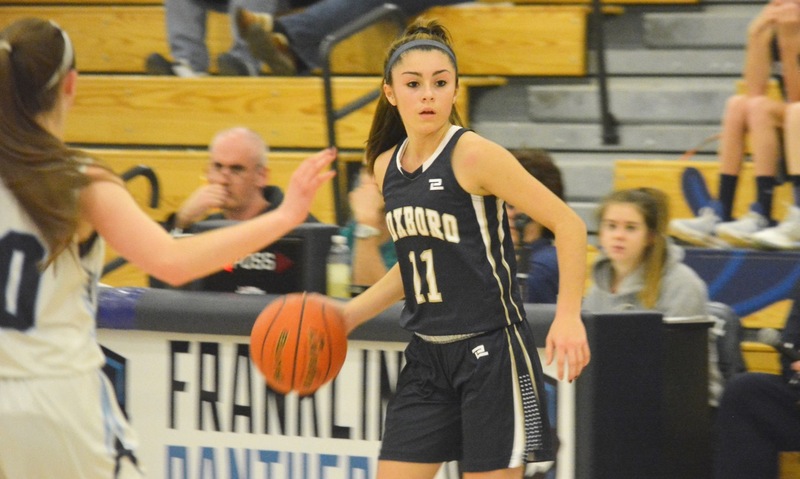 As a freshman on Foxboro’s state championship-winning team, Mollica was named to the HockomockSports.com Third Team and she returns with expectations of being one of the top guards in the league this winter. A sharp-shooting point guard, Mollica will see plenty of the ball this year and won’t have the core of upperclassmen to defer to, as she did last season. She is going to be the focal point of the offense, after averaging more than 11 points per game and leading the Warriors with 60 made three-pointers as a rookie. Her ball-handling ability, quickness on both ends of the floor, and her vision (two assists per game last season) have opponents raving about her potential to be Foxboro’s next big star. The Warriors graduated a very strong senior class, but Mollica gives Foxboro hope that the rebuilding process will be quick and include a return to the state tournament. Despite battling an injury that kept her out of the final few games of the regular season, O’Connor was named to the HockomockSports.com Third Team for the second straight winter. She led the Warriors with nearly 13 points and six rebounds per game and was also a force on the defensive end of the floor, with nearly three steals per game. A guard with the size to match-up against forwards, O’Connor is one of the league’s top shooters off the dribble. She gets good elevation on her shot and has a quick release that is hard to defend, but she also has the vision to pick out an open teammate. O’Connor will give second-year coach Amy Siggens a focal point to run the offense through and will be one of KP’s top ball-handlers against the pressure defense that Hock teams like to play. When Patneaude went down with an injury in the final few games last year, Taunton struggled to make up for her offense (10 points per game) and the Tigers dropped out of the race for a possible playoff spot. Taunton will be hoping to get a full season from the lefty shooter, who can open up opposing defenses with her range and provide leadership for a relatively young roster. A solid spot-up shooter, Patneaude can also score off the dribble and she has the strength to finish at the rim. She needs to assert herself more on the offensive end, as she can fade from the game at times, but has been Taunton’s most consistent offensive threat for the past few seasons. With Patneaude back for another season and the development of several younger teammates, the Tigers will be eyeing a run at the postseason. Midway through last season, Sheldon seemed to turn a corner and became much more aggressive around the rim on both ends of the floor. As her confidence grew, she provided OA with a consistent scoring threat in the paint to complement Kayla Raymond, another rim protector, and someone who could control the glass. With Raymond gone this winter, the Tigers will be counting on Sheldon to continue being a double-double threat every night. She showed off a nice touch from 10 feet, but it was her increased aggression at the rim, fighting through contact to finish that lifted her scoring average to nine points per game last year. Sheldon is one of the top returning post players in the league and she should see even more of the ball this year, as the Tigers reload in search of another league title and playoff spot. Even as an underclassman, Thomas played several roles for the Bombardiers, from primary ball handler to wing scorer to defensive stopper and she showed flashes of being one of the more dynamic combo guards in the league. Consistency will be the key moving forward for Thomas, as Attleboro looks to bounce back this winter and make a run at the postseason. With the ability to get by defenders and create space for her jumper or to get all the way to the basket, Thomas can be the playmaker that Attleboro needs on the offensive end, while her reach and quick first step make her a handful to deal with on the defensive side. As Thomas develops, she has the potential to be the go-to player that Attleboro will need to fill in for the loss of Sam Pierce. Wright earned HockomockSports.com Second Team honors during a strong sophomore season in which she helped the Black Knights go on a run of 12 wins in 13 games to qualify for the state tournament. The lanky point guard adds size to the Stoughton backcourt, allowing her to guard multiple positions and be a force on the glass, and she has the strength to get through the lane to the rim. A creative finisher in traffic, Wright led Stoughton with more than 10 points per game last year and that should go up as she develops her outside shot and gets more comfortable with her fellow guards Shyanne Trinh and Sydnee Hyacinthe, who both have the ability to stretch the floor. The Black Knights love to pressure the ball on defense and Wright has quick hands to cause havoc and the long strides to get ahead on the break, which will be even more important this year thanks to the team’s guard-heavy lineup.